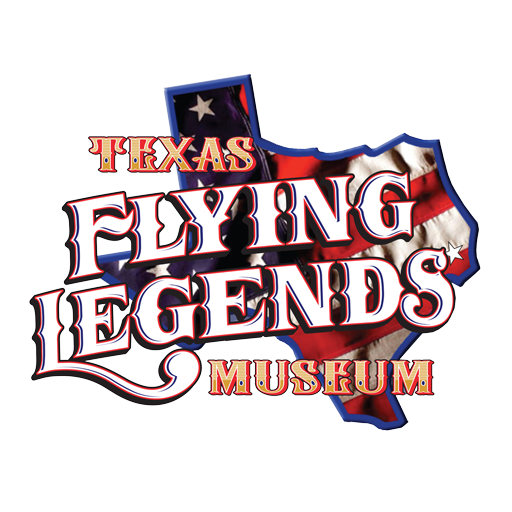 One of the unique aspects of the Texas Flying Legends Museum (TFLM) is that they are a flying museum. In fulfilling their mission, Honoring Our Past – Inspiring Our Future, the aircraft of TFLM are flown, displayed and present aerobatic demonstrations across the country. Great pride is taken in their aircraft, flying the finest examples in stunning condition. The TFLM wants their mission to continue once the planes are washed, serviced and back in the hangar, and that’s where YOU come in. We want you to be able to take the best possible photographs of the squadron and share those images. In that way, their mission lives on even those days the planes aren’t flying! No matter your skill level, you have something to contribute. And TFLM knows from experience that the more you practice, the more you shoot, just like flying warbirds, the better you become. Whether a pilot or photographer, it all begins in the classroom and then expands as far as your imagination and passion can take it. 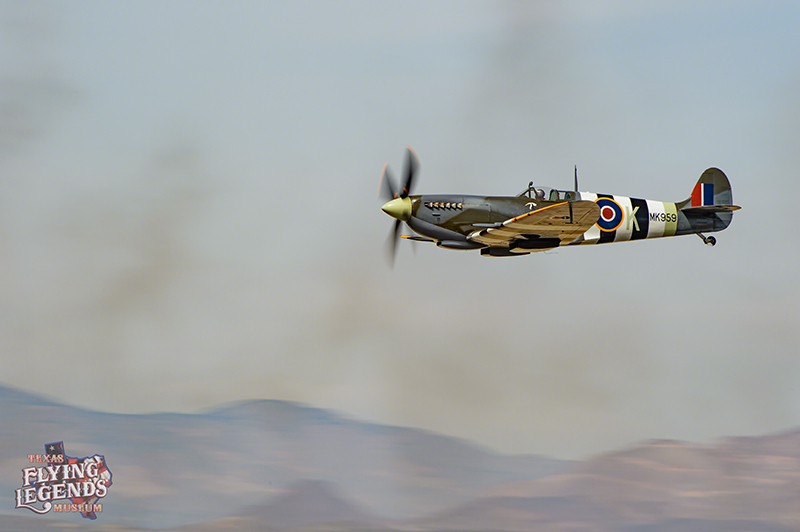 It’s with this understanding we are pleased to provide this guide to aviation photography! One of the best things about aviation photography is it doesn’t take a lot of gear. You can easily photograph the TFLM aircraft with one body and lens. What should you look for in gear if you’re new to aviation photography? How about if you’re already shooting? No matter your expertise, keep in mind that aviation photography is often a fluid shooting situation, taking place over most of the day. Being able to move quickly all day long should be taken into consideration when selecting gear. You can always fall back on the old adage, KISS – Keep It Simple Stupid. You’ll never go wrong. The preferred starting rig would be a camera body that can fire at least 5fps and has a good size buffer, permitting constant firing for at least 15 frames. These requirements permit you to shoot for most of the Banana Pass (explained later on) and not miss a shot. Now if you have a camera that performs better than this (current best is 12fps/200 image buffer), then that’s all the better. You want this kind of performance for two major reasons: ability to capture all the action without running out of memory, and ability to capture the “perfect” moment by choosing the best image with important subtleties. You might not want to go to this extent and choose to shoot with your smart phone or tablet. This is doable but you will be a little more challenged in keeping up with a 200mph plane flying past you. One way to make this easier is to use the video feature on your device and then extract a still later from the video of the perfect moment. This technique permits you to have fun and success with the ease of shooting with these devices. When it comes to lenses for ground to air photography, you can work with just one and cover one heck of a lot of the TFLM aircraft (ground to air is the term for photographing planes flying by). The most common and popular are the Nikon 80-400VR and the Canon 100-400IS because of their range, weight, AF speed and sharpness. The focal length range is probably the most important aspect to think about. 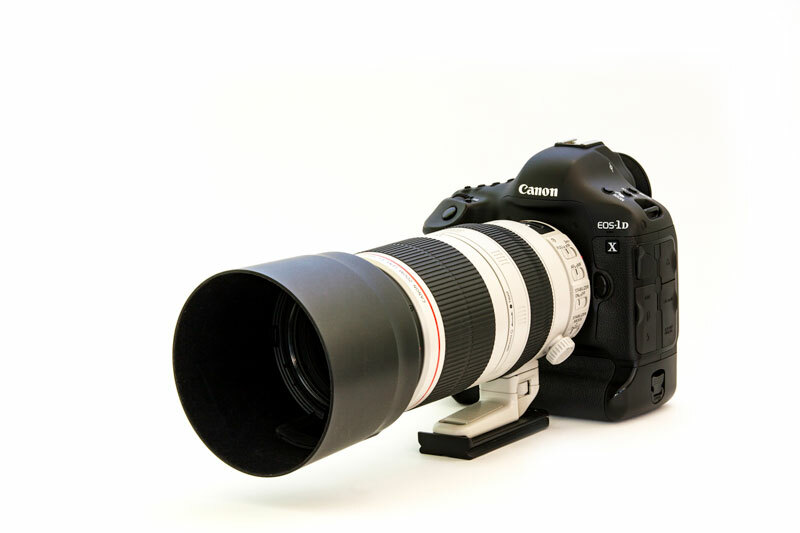 Lenses with a focal length of 400mm or longer work great for photographing aircraft in the air. At most airshows, all aircraft must fly at a safe, predetermined distance from the crowd. Many performers including TFLM take their performance up as well, high above the field to fly their show. These reasons and more make the 400mm lens a great focal length. Some venues make static shooting possible (statics are parked aircraft). While you could use the same lens as you use for ground to air, a shorter lens will make your photography a tad easier and more creative. For statics, there are many possibilities from 11mm to 105mm. 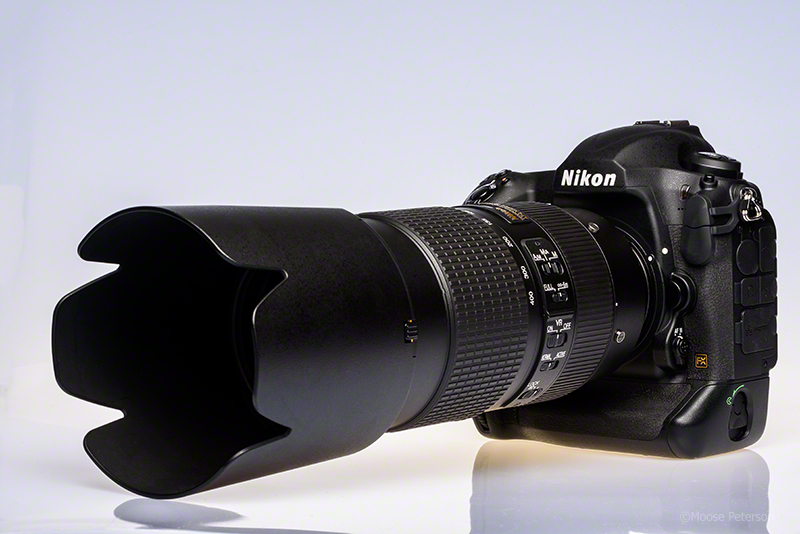 Many carry a zoom lens, such as, the 24-70 or 24-105, which is a great idea. These zooms not only work well for statics but also for large formation flights like TFLM when they begin and end their aerobatic presentation. Can you have more gear? Hey, this is photography, where you can always have more gear! You might add a fisheye lens or flash, filters like a polarizer or go all out and get a really long lens with its own dedicated camera body. Just remember that you have to carry the gear to make it effective. Leaving it in the car won’t help you. So working an airshow all day, all that gear can wear you down. So if there is one time where less is more applies, it is camera gear for aviation photography at an airshow. There are two very basic but essential techniques you need to use, handholding and panning. The key to making the most of these two techniques is you must practice, practice, practice long before you need these skills and then never stop. They need to become second nature so when you’re at the airshow and you have the TFLM formation in your viewfinder, you’re concentrating on the action and not the technique. Basic Handholding takes advantage of gravity and our body to provide our camera a firm and stable platform to operate. It starts with the left hand, the most awkward part of the technique. You need to invert your hand so your palm is pointing up to the sky. The lens needs to rest in your left palm. You know you’re doing it right if you open up your grasp and the camera/lens stays in your palm. We do this because we need gravity to work for us, forcing the camera/lens down into our palm. Next, bring your elbows into your sides. Lastly, bring the camera back against your forehead. A rubber eyecup helps here by acting like a shock absorber. With your palm, elbows and forehead, you have three points of contact. This is basic handholding and the last part of the technique is rolling your finger to activate your camera and then press a little harder to fire the camera. You don’t want to lift your finger up and down to fire the camera, but rather roll it so you don’t create any camera movement. The other technique, Panning, you use in concert with proper handholding to get a sharp image of a moving subject. Panning is the technique that permits us to get sharp photos of moving subjects even if we are shooting with a slow shutter speed (needed for prop blur). The general idea is we move the camera with our subject (flying aircraft) so as far as the camera is concerned, the subject isn’t moving at all. The key to success is proper handholding and then smoothly moving the camera with the subject. That means you start this by using proper handholding. The panning is then simply twisting at the waist to actively follow the subject in the viewfinder. Having your feet planted supports this action while providing a stable platform for the camera. We all have a point as we twist our trunk where we feel the most comfortable that we don’t feel like we are actually twisting. In panning, knowing this place of comfort, we use it so when we are at that point we are pointing at the best background. Background is an important concept in photography and by recognizing it and then setting up your pan for this point helps you get the sharpest and best photograph. The key to both of these techniques is to practice long before you need them. You can do this but photographing cars driving past you on the street. Shoot at a slow shutter speed like 1/60 until you consistently get a sharp photo. Once you can do that, you know you’ve got the techniques down pat. You can take your photography to the next level by adding a few simple concepts to the basic techniques. They all revolve around communicating visually in our still images, movement. The movement is flight, a fast moving aircraft that is either propeller or jet propelled. Based on the aircraft, we have a couple of techniques so the aircraft in the still photograph looks like it’s flying and not hanging in midair. 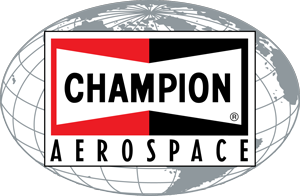 The most challenging is the prop driven aircraft. This is because we need to blur the prop to communicate motion and that requires a slow shutter speed. How slow? Here’s a chart that will provide you with a starting point. A slow shutter is not all that is required to show a blurred prop in a photograph (if shooting with a smart phone or tablet, you might want to get the app Slow Shutter to accomplish this technique). In order for that blurred prop to show up in our photograph, light has to be shinning on it. This means, the aircraft must be flying into the sun for the blur created by the slow shutter speed to appear. So if the aircraft is not flying into the sun, you can use a faster shutter speed. Flying into the sun, use a slower shutter speed. You have probably seen photographs with what is called a full disc blur, where there is just a blurred circle at the front of the aircraft. While this is nice, it is not required in every photograph. When photographing jets, you have no prop to blur so shooting with a slow shutter speed is not required. Showing movement with jets is a challenge because you need something in the background to convey movement. The best and simplest are clouds. If they are way off in the background, then even a slow shutter speed won’t blur them but they still provide a sense of place, which to the mind translates to flying. If they are close though like ground fog or perhaps the smoke from pyrotechnics at an airshow, using a slower shutter speed like 1/60 or 1/80 will blur that background, communicating speed. The TFLM aerobatic show is a great photographic opportunity for you. 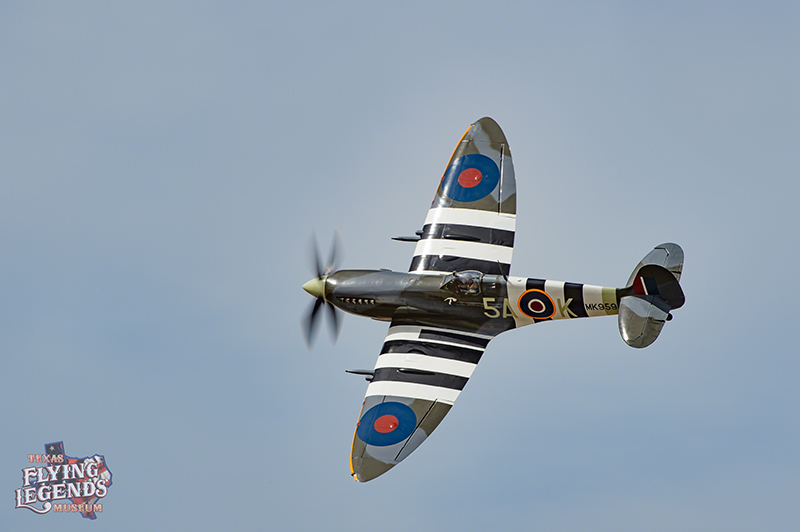 Their show not only tells the history of the TFLM aircraft and their roles in the freedoms we enjoy today but also shows them all in their best light, providing you with magnificent photographic opportunities. Here is their show with suggestions on how to make the most dramatic photographs minute by minute. The TFLM show starts with a formation flight of all six aircraft making a perpendicular pass over the crowd at show center. This formation flies straight in, over the crowd and then circles behind and around the crowd back front making a right to left pass (most of the time). You might start with a longer focal length like the 400mm end of the 80-400 zoom and then as they come over head, zoom back to 80mm (which might still be too long to photograph the entire formation). As they fly past, don’t stop shooting! Turn around because the TFLM aircraft will hold their formation as they circle back and this can be a great photo. Try shooting it vertically adding extra drama to the formation. The Spitfire then leaves the formation to make two passes in front of the crowd and the formation of five ships set up for their next passes. The passes the Spitfire makes are all in front of the crowd, two horizontal loops low to the ground providing you with incredibly unique views and photographs. 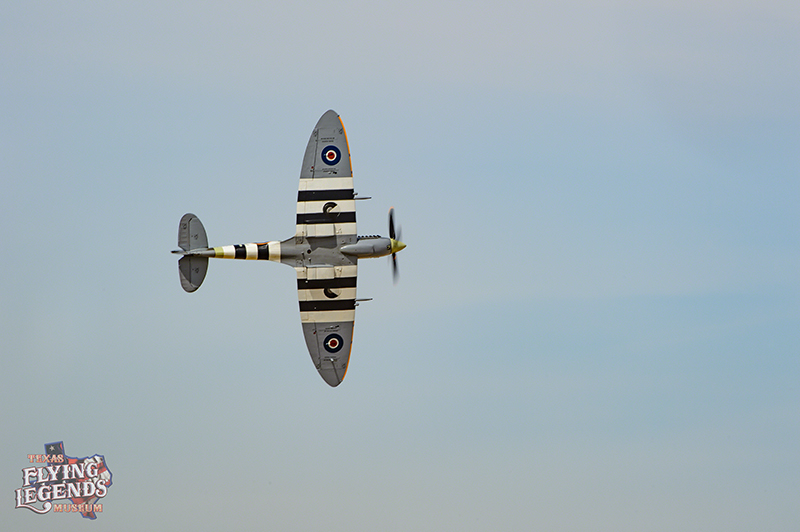 You will see the very cool bottom of the Spitfire as it passes, showing off its unique paint scheme. You could shoot either horizontals or verticals as the Spitfire circles in front of you. With the dual passes, you have the opportunity to do both, or perfect the camera orientation you like the best. Coming up next is a very dramatic pass of the five ships. 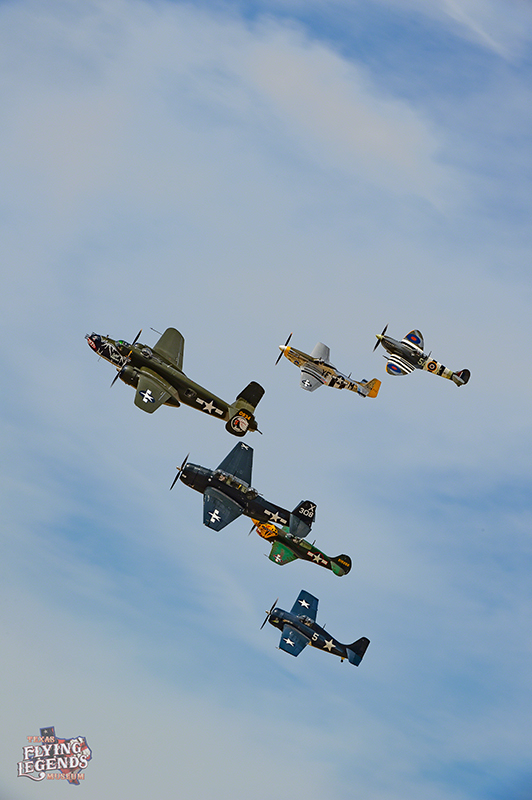 Being led by the B-25J, the P-51D, TBM-3E, Wildcat and P-40K will come from show left in a dramatic “bottoms up” pass. You rarely get to see the bottom side of the aircraft and this dramatic presentation is a real crowd pleaser. 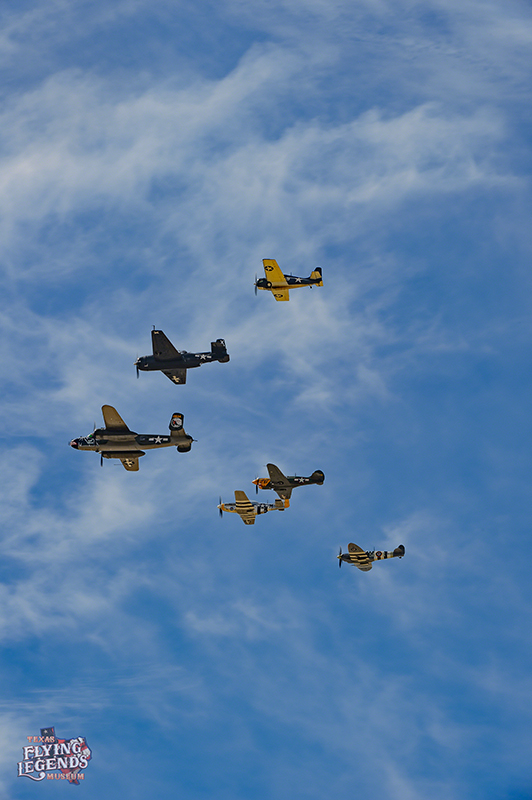 You’re going to want wider rather than longer focal length to capture the entire formation. You might take note of the focal length you used to capture the overhead pass of the formation to give you a good idea what you need for this pass. The B-25 then comes show right for what we call the “Doolittle Pass” in honor of the Doolittle Raiders. The B-25 will be high on the right diving down to show center and then climbing out the other side. 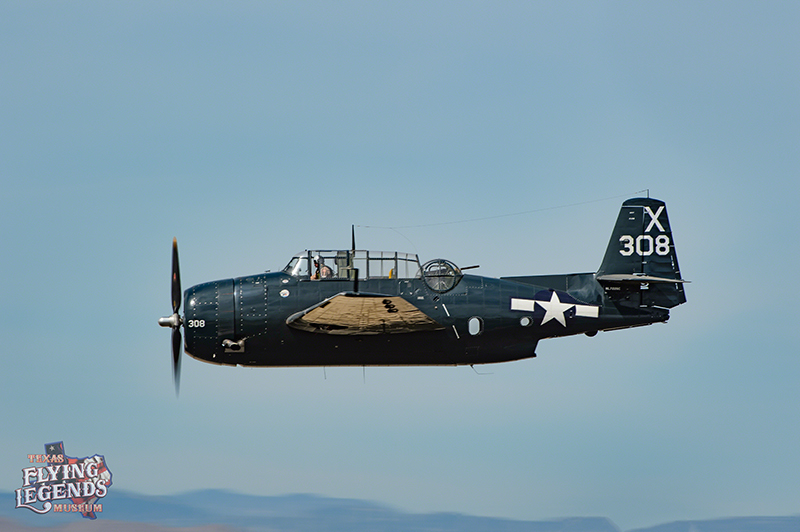 While there are photos to be made during this pass, you might let your camera buffer empty and just take in the sound of the diving B-25. Then again, if you have room in your buffer, some great shots can come from this pass. Coming up next are two passes of two-ship formations from show right to left. 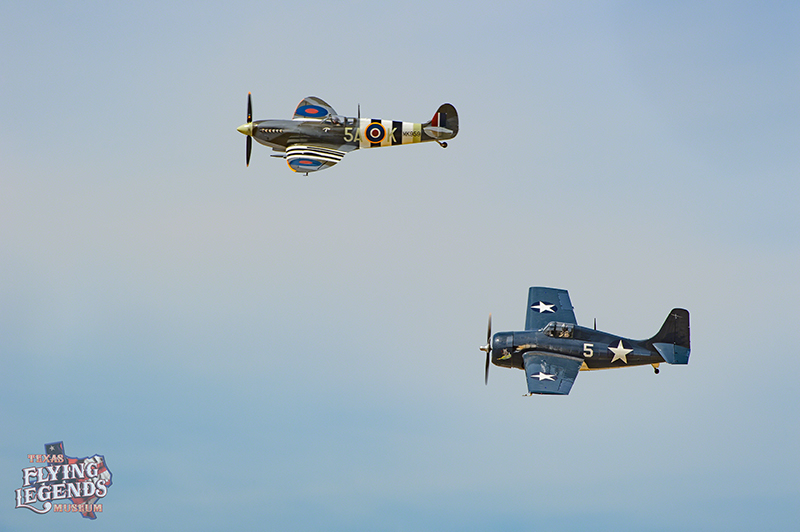 The first two-ship pass is the P-51D & P-40K (the P-51D is closest to the crowd). The second pass is the Spitfire and Wildcat (the Wildcat is closest to the crowd). You have a couple of photographic opportunities here. Our first recommendation would be to go a little wider and get a photograph of both aircraft at once. This is a great shot that provides scale and profile comparisons of the two aircraft. 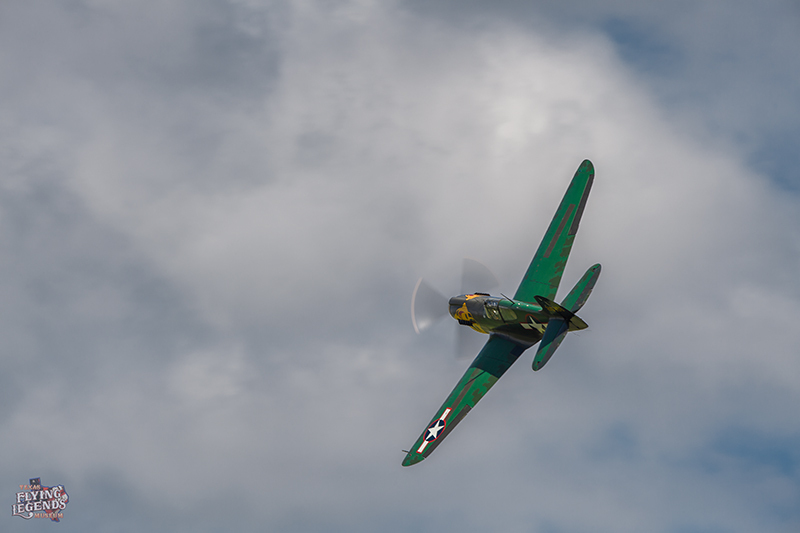 You could also go with a longer focal length and photograph singular aircraft. Everyone has their favorite aircraft and this would be the first of a couple of opportunities to single them out. This is your only opportunity to photograph the dual ship formations. 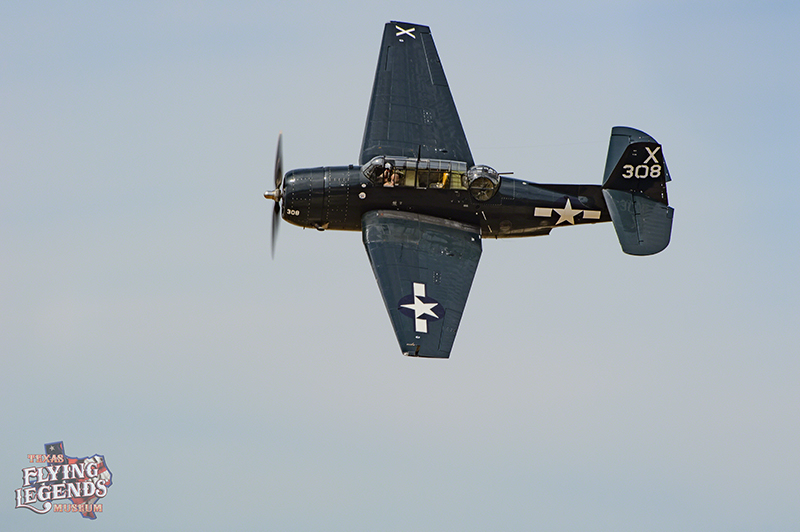 The TBM-3E now gets its opportunity to make its bombing run pass from show right to left. It will be flying by itself so a longer focal length is your best option. 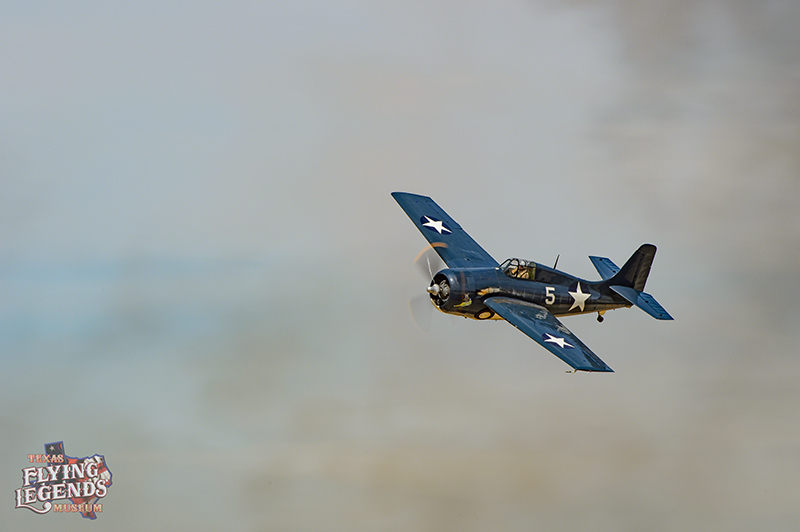 The TBM-3E will be making a 360 pass like the Spitfire did at the opening of the show, providing you with great opportunities to photograph all angles. 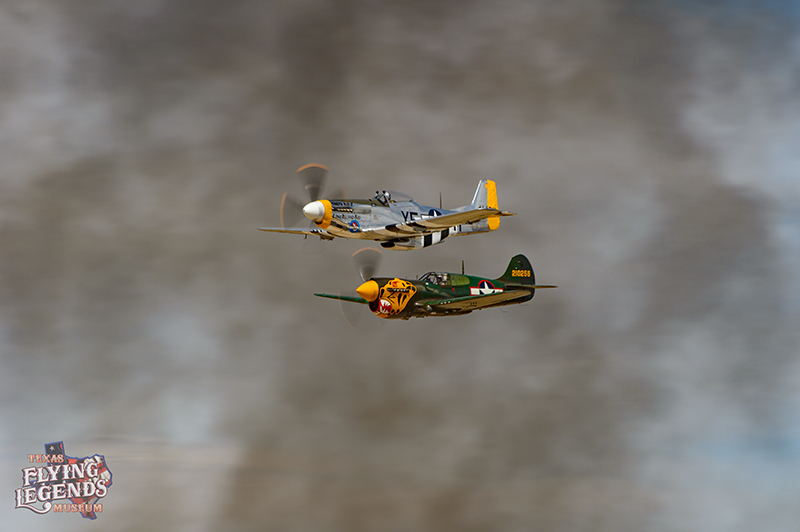 Next, the P-40K and P-51D make a low to the ground pass coming from show right. The P-40K then doubles back going show left to right to give you a great look at the abilities of the P-40K. 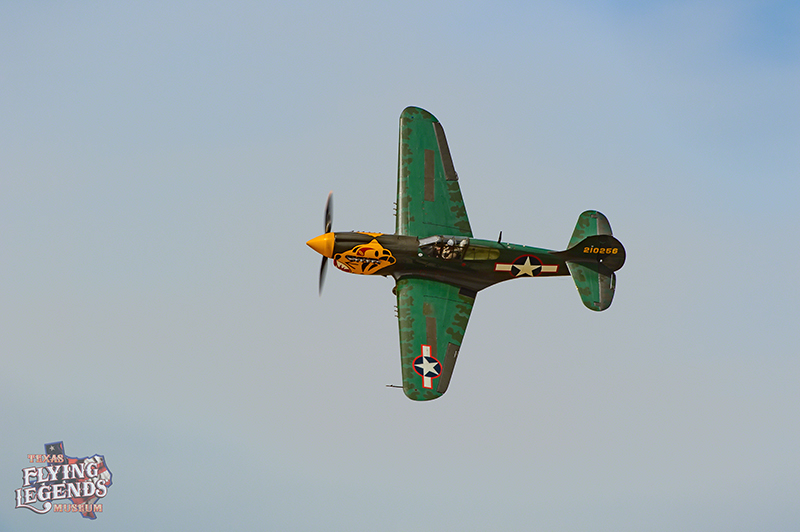 It’s a great flight giving you opportunities to photograph the P-40K in many different attitudes. 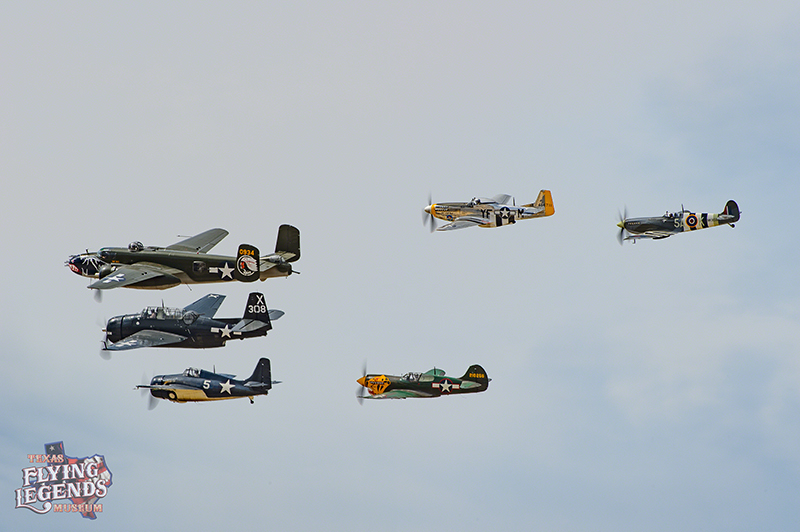 You then have a “strafing run” of all six aircraft from show right. 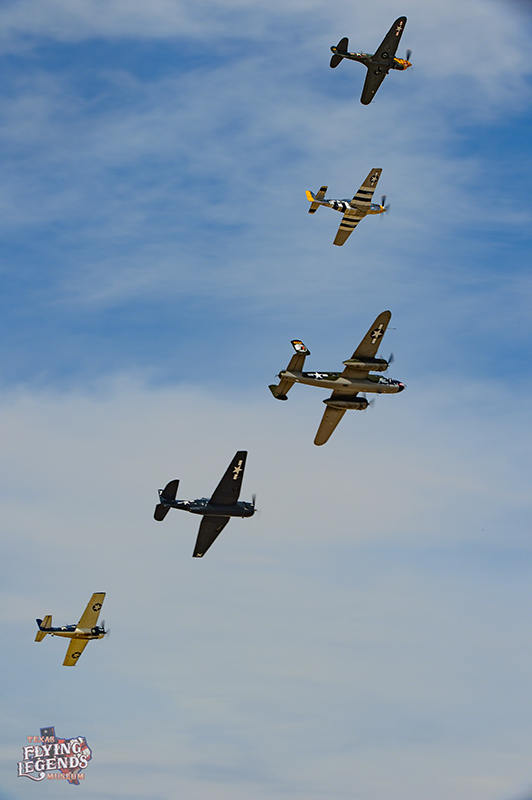 The B-25J, Spitfire, Wildcat, TBM-3E, P-51D and P-40K (in that order) are well spaced out so you can photograph each aircraft individually in a very clean profile. Knowing you have your camera and your buffer could fill up, the TFLM squadron makes a second strafing run. With this knowledge, you could focus in on just your favorite aircraft, or shoot every other plane in each run, so after two passes you have them all photographed with complete lead in to lead out coverage. These passes will give you clean profile photographs. This leads into the “Photo Pass” where the aircraft in the same order fly again show right to left. The aircraft will make a big Banana Pass in front of you, showing off the topsides of the aircraft. The TFLM aircraft slow down on this pass giving you a great opportunity to photograph lead in, straight on and lead out photographs of each aircraft. 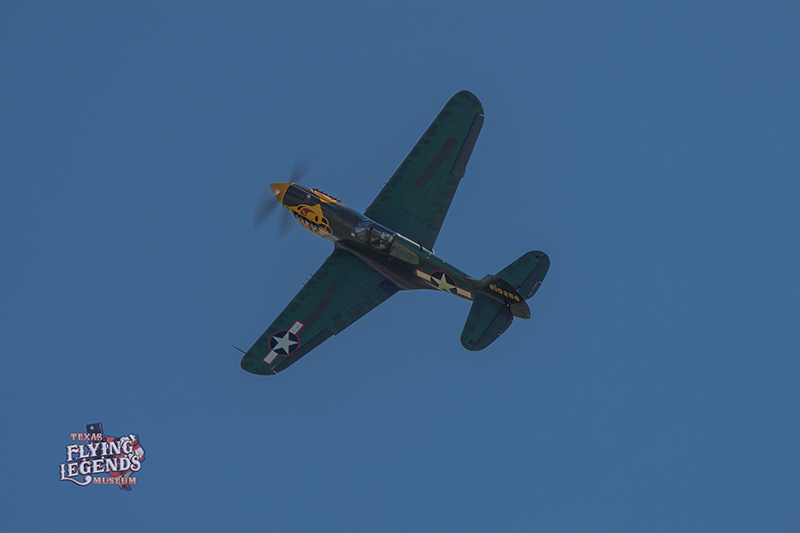 It’s a marvelous finish to their presentation and killer way to finish your photographing of the Texas Flying Legends Museum squadron! The TFLM pilots and ground crew thank you for focusing your attention, talents and passions on its aircraft! You’re a big part of getting their message out to the public about our history, the veterans and the freedoms we enjoy today. Remember TFLM would love to see your photographs and share them, so please post them to the TFLM Facebook page!